Our traditional ‘standard’ tree is an optimum quality two-year-old tree, which ranges in height from approximately 59" to 72" depending on fruit type, rootstock selection and seasonal growing conditions. C&O's two-year-old trees are shaped to required standards and are an excellent basis for a successful orchard enterprise. If your preference is for vase-shaped or central leader trees then we must know this prior to ‘heading’ the trees in October. Spring budded trees are propagated early in the summer prior to delivery. They are considerably smaller than two-year-old trees. C&O’s premium quality spring budded trees range in size from around 20" to 36" and should not be confused with our larger, premium quality two-year-old trees. Many orchardists prefer to plant smaller spring buds for several reasons. Ordering spring buds later in the year allows further time to make decisions about which cultivar to plant. Alternatively, a grower may have a particular growing technique which calls for a smaller tree. Orders for spring budded trees should be placed by the end of October, for delivery the following winter. These quality trees are normally smaller than two year olds, they are 'bench grafted' then planted in the spring of the year prior to delivery and then grown for only the one season. Generally these range in size from 36" to 72" with feathering dependent upon the variety being grafted. Feathers are also known as “whips” or “rods”. One-year-old grafts are available for cherries and apples. These must be ordered by the end of June for delivery the following winter. Ordering does not automatically guarantee availability of any given rootstock/scion combination. Your trees will be delivered in prime condition. We take great care in the loading and transportation of our stock to ensure the trees are moist and in good condition. After delivery the roots may be covered with ‘shingletoe’ (cedar shavings). This product is used to maintain moisture on the roots. It should not be used in the planting hole – but may be continually moistened by the recipient to help maintain moisture on the roots during the short time period between delivery and planting. If an extended period of time (more than 1 week) is going to elapse between receiving trees and planting, the process of “heeling-in” is a good option. Prepare a heeling-in trench well in advance. Select a well-drained, protected site and have adequate water readily available. Once the trees are placed in the trench it is important to apply water to the roots before covering them with loose soil. Avoid heavy cloddy soil as this will not fall in around the roots in the middle of the bundles. Water the trees thoroughly with a sprinkler and soak the soil well around the roots. Your trees will remain in good condition if kept in this manner until planting, providing you keep them moist by applying water with a sprinkler for a thorough deep soaking as required during dry spells. Heeled-in loose-rooted trees in a dry atmosphere will benefit from overhead watering to minimize the effects of wind dehydration. Trees must be planted out well before spring growth begins. Delaying the planting of trees, even well into spring when soil is in peak condition, can be an option in some seasons. If your planting area is not ready, or is too wet to plant, then the trees can be stored in a coolroom at 35°F – 37°F. Care should be taken to keep the roots moist and covered with peat moss or similar material. CAUTION: Trees should not be stored with fruit because ethylene gas given off by fruit is toxic to young trees. Coolrooms where fruit has been stored should be well ventilated before using them to store trees. Trees stored in a coolroom at the optimum temperature with adequate moisture around the roots and high humidity will hold well into spring, allowing planting to take place in prime soil conditions. However, with late planting and possibly warmer temperatures, it is critical that young trees are adequately watered. The site should be prepared well in advance. It is desirable that irrigation be in place before planting commences so that the trees can be satisfactorily watered. If irrigation is not immediately available other means of adequate watering is necessary. Delays in watering can often be the difference between success and failure. Young trees dry out very quickly, especially in windy conditions. Plan the management of the planting and aim to minimize the possibility of the trees drying out. Take only as many trees to the planting site as can be handled within a short period of time. The roots of trees taken to the planting site should be kept moist at all times with wet bags or moist packing material. Wet the roots with water before placing them in the soil. Trees should not be planted any deeper than the depth they were planted in the nursery. A color change on the roots will indicate where ground level was in the nursery. Under no circumstances should any fruit tree be planted with the bud union below the soil line. Water in well, making sure to pack the dirt in the planting hole, ensuring the removal of any air pockets from around the roots and supply adequate moisture to the tree. Newly planted trees need special attention as they require a considerable amount of soil moisture during the establishment phase to reach their potential. If dry conditions occur during spring and early summer, young trees can stop growing and it is difficult to restart them again. Fruit trees are particularly prone to ‘stopping’ after a dry spell. Should this occur, the trees will be set back and not grow to their full potential in the first year and may struggle in future years. It must be remembered that even though the young tree is dormant, it is living and as such if conditions are unsatisfactory, especially in dry windy conditions, can dehydrate very quickly. Weed growth can rob the root system of precious moisture and cause the tree an unnecessary setback. Excessive (over) watering of new trees may also be a problem. Try and regulate your watering schedule to match your soil & weather conditions. We strongly advise against placing fertilizer, including organic fertilizer, in the hole or in close proximity to the roots when planting young trees. There are too many dangers from fertilizer root-burn occuring with this practice. We suggest the use of slow release ‘starter tablets’ as a safe way to get fertilizer to young trees. In some years weather conditions are more conducive to disease problems than other years. Young trees which are not yet established in the orchard are more susceptible to disease. At C&O Nursery we carry out a spray program for young trees in our nursery and heeling-in ground, we recommend that growers investigate the introduction of an adequate pest and disease spray program and its immediate implementation once trees are delivered. After planting the orchard, inspect the area regularly to ensure that the trees have adequate moisture to become established. The color photographs in this website have been taken using techniques to reproduce the color of the fruit as closely as possible to the true color; however it must be remembered that given the constraints of the photographic and web processes, these must be viewed as indicative only. Throughout our website, various percentages of skin color have been stated; however, these percentages and color pictures should be used as a guide only. Many variables are indicative to producing color including climatic conditions, soil type and individual growers’ cultural practices. 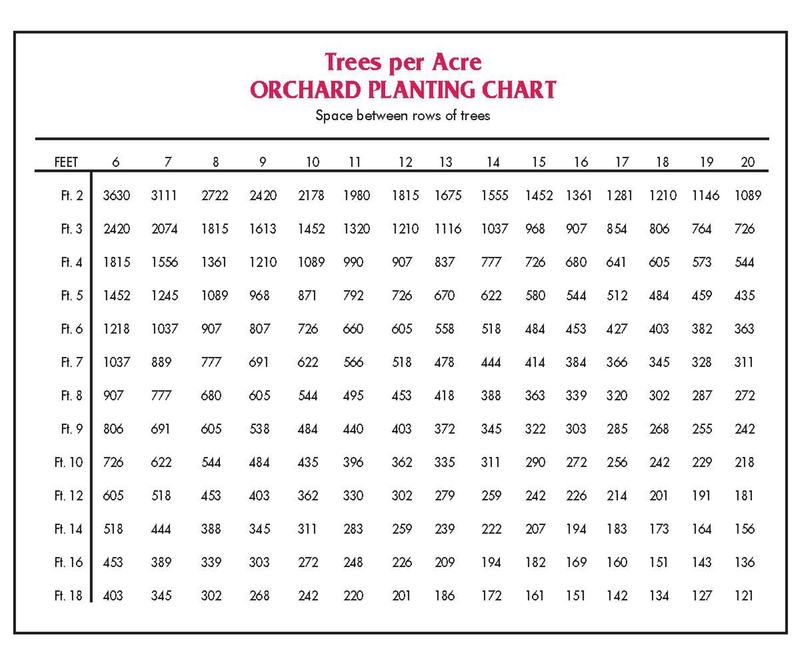 The following table is a quick reference guide to calculate the number of trees per acre. A temperate zone deciduous fruit tree requires an accumulation of chill units below 44 degrees Fahrenheit during the dormant season. To ascertain whether an area achieves sufficient ‘chill units’ is not simply an addition of hours when the temperature falls below 44°F. Researchers have models regarding chill unit accumulation and one theory suggests that the accumulation is effected by how many hours, and to what extent, the temperature climbs above approximately 64°F, and that high temperatures negate the accumulation of low temperature hours. The following conversion chart can be used as a guide to estimating chill units. To use the above chart obtain the average temperature for the coldest month of the year. Apply this figure to the lower line of the chart (average temperature) and cross reference that figure to the graph line to work out the approximate chill unit for that area. For example if the average temperature for the coldest month of the year was 50°F then the chill unit would be approximately 830. Local weather stations should be able to supply average monthly temperatures. The cultivars within each of the different fruiting types are often grouped together and a chill unit requirement for that fruit is stated as a generalization only. For example it is often stated that European plums require between 700 and 1000 chill units, and that Japanese plums require between 500 to 900 chill units. Each cultivar within each grouping has an individual requirement making any specific estimation of chill unit requirements, per cultivar, very difficult to forecast with any accuracy, from the group generalization. Chill unit estimation per cultivar appears to be an inaccurate science and one that must be taken as very general, unless a complicated scientific experiment is conducted in a controlled environment. In the absence of a fully integrated study, years of full-bloom timing observations of each cultivar and daily comparisons with a selected mid-range cultivar, is necessary before an estimated forecast on chill unit requirement can be made for a specific cultivar. Whilst chilling is important for satisfactory fruit set in deciduous tree fruits, some cultivars are naturally precocious and will set a commercial crop even when the chill factor is lower than considered necessary. The reverse of this can also be true. The amount of accumulated chill units and the heat unit requirement of a particular cultivar determines its bloom time. USE CHILL UNIT INFORMATION WITH CAUTION. Further information on chill units click here. Another factor for consideration is the separate issue of heat unit requirement which varies from cultivar to cultivar. Each cultivar therefore will react differently for time of bloom for each area. Forecasting which cultivar will be a successful cross-pollinizer in any given district can be extremely difficult given the many variables involved. Recommendations of cross-pollinizing cultivars are only a generalization and should be qualified with available local information. It can happen that in any given season a particular cultivar will cross-pollinate a specific cultivar, but next season, because of a different chill unit factor and the heat unit requirement being satisfied, the bloom time of the two cultivars may not coincide and unsatisfactory cross-pollination is the result. A high chill cultivar not cropping in a low chill area. A variation to the norm of bloom time per cultivar in relation to other cultivar bloom times. Distortion in the shape of the fruit. It is a common occurrence for elongation of stonefruit to occur in high chill cultivars growing in a lower chill area. Recent research with peaches and nectarines has indicated that with some cultivars a pronounced tip may occur on fruit, if the temperature during bloom time, is in the region of 86°F. The temperature level which causes tipping of fruit varies with different cultivars, due to their genetic differences. High chill apple cultivars grown in areas of inadequate chill will generally produce flatter fruit. Low chill apple cultivars grown in higher chill areas will produce elongated fruit. The number of cells in the fruit being different which could affect the keeping quality. Attractiveness of blossom to bees. Timing of bloom period in a specific area is directly related to the chill unit requirement, together with the heat unit accumulation, of each cultivar being satisfied earlier than or later than the cross-pollinizing cultivar. Weather at time of bloom can affect the flight of bees and can also affect the bloom. Prolonged periods of rain can contribute to pollen losing viability. Cooler weather conditions during bloom inhibits pollen from completing the fertilization of the ovary. Bees work up and down a row more consistently than crossing from row to row, therefore the proximity of cross-pollinizing cultivars is a major factor. Competing food sources for bees in the area of the orchard as well as neighboring properties is an important consideration. Bees, the main pollinators of fruit trees, are known to be less active when the temperature is in the range of 54°F or below. Care should be taken with the use of sprays, especially insecticides. Using chemicals during the bloom period should be avoided as they can be toxic to bees. Other insects and wind also play a minor role in pollination. The percentage of pollinizers required for successful cross pollination varies from cultivar to cultivar. It is dependent upon the ease with which a cultivar sets fruit. Insufficient cross-pollination in apples and pears can lead to reduced seed development which can cause misshapen fruit and reduced storage life. At the time of publication, cherry pollen incompatibility groupings for some of the newer cultivars is unknown and accurate research results are unavailable. There is a range of universal pollen donors available and the use of these as pollinizers should be considered if the incompatibility group is unknown for the cultivar you wish to grow. The results will be satisfactory as long as blossom timing coincides. Crab apples can be used as cross-pollinizers providing that brightly colored blossoming cultivars are not selected. It is important for the grower to choose rootstocks which are suitable for the area, for example, if either nematodes or lime-induced chlorosis is a problem, then consideration should be given to using a resistant, or tolerant, rootstock where available. Some early flowering cultivars are susceptible to frosts, a factor to be considered when choosing a site. If possible choose rootstock vigour to match soil type. Low chill cultivars are not recommended on high chill rootstocks and vice versa. The use of ‘crown gall culture’ must be considered when planting stonefruit trees. At this point in time, the lack of commercially-available size-controlling rootstocks for stonefruit makes summer pruning necessary for trees grown on vigorous soils, otherwise shading out can cause a lack of fruit bud initiation and poor quality fruit in the shaded part of the tree. All bare-root trees are susceptible to dehydration at time of transplanting and until they are established. When planting trees keep roots damp and irrigate well after planting. As root growth begins before the trees shoot, adequate soil moisture levels must be maintained for all newly planted trees even though the trees may appear dormant. It is necessary to provide adequate water and pest and disease control to trees after harvest (particularly early-maturing cultivars) to assist in fruit bud initiation and to help avoid 'doubles' in the following season. It is an established policy of C&O Nursery to present new cultivars in a forthright manner. We intend to keep the industry informed reporting on any good or bad features of each cultivar as we know them and present an overall picture to enable the industry to decide on their suitability. It is not our intention to promote one cultivar against another, but based on area performances, we will certainly impart our accumulated knowledge if one appears to have more potential than another.